Looking for a cheap place to stay in beautiful Koh Tao? 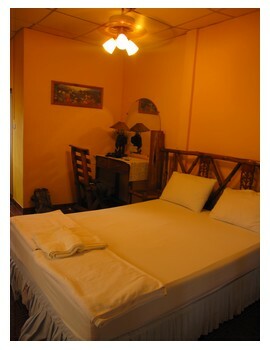 If you want budget accommodation in Koh Tao Island, you'll have to expect basic bungalows and rooms. The average price of cheap rooms and huts in Koh Tao is about 300 B, even more in the high and peak season. Diving is the main reason why most travelers go to Koh Tao. So if you go diving with a dive operator, they have discounts on rooms. IMPORTANT: If you want to stay on the islands of Koh Tao, Koh Phangan and Koh Samui, for the moon parties, always book room in advance! We were met by a very nice, clean and spacious bungalow. After traveling for many hours from Bangkok, it was great to sleep in a soft bed! Our double AC-room had a small bathroom and table and chairs right outside the door. A nice place for smokers! The Tropicana area itself is very idyllic, with a fine garden and dozens of butterflies. And right by Tropicana, you'll find Baan Kao beach. But would we ever stay there again? At first, the staff seemed very nice. I even managed to lock the keys inside the room the first day, and one of the receptionists was helpful about that. The second night, we had dinner at their restaurant. They required all guests to park their footwear before we entered the restaurant, and that was OK by me. We were the only people at the restaurant during those hours, and we placed our footwear right by the entrance. "Hihi, maybe you left inside room? Hihi"
The way they said it was not funny at all, it was patronizing. I felt f****** stupid, annoyed and felt the temperature rising. So much for taking me serious! But I just left the scene, struggling to keep my anger back, and hoped the flip-flops would turn up. And no, I didn't actually leave them in the room. I would have noticed it if I had walked bare foot from the bungalow to the restaurant, I thought to myself. The third day, we decided to book a snorkeling trip to Nangyuan Island. The nice receptionist (who also locked us in) told us to be at the restaurant at 08.30 am, and pointed at the restaurant near the beach (there are two restaurants, one by the main entrance and one by the beach). And so we did the following day, but we came earlier around 8.00 am to have breakfast. It was 8.30 am and nothing was happening. The youngest girl who worked there was running back and forth for a couple of minutes. It seemed like she was looking for something or someone. "Where you've been? I've been looking for you all around, by the bungalow and here." I felt the temperature rising AGAIN… and my boyfriend's patience was running out. The girl who had been running passed us for the last 15 minutes, stood right by us and accused us for not being there at the appointed time…! It was just juvenile behavior, and she must have been blind if she didn't see us sitting there. We told her our side of the story (we've been sitting there for 40 minutes, watching her run by us for 15 minutes of that time). But her English was limited, so what a f***, we just shook our heads and followed her. This time, she told us to wait by the main entrance and wait for the taxi to return. We waited by the main entrance, but no taxi came to pick us up. Then an elderly lady, who worked there, asked us what we were doing. We told her that we were waiting for a taxi heading for the pier. "Taxi to snorkeling?! Why not here 15 minutes ago??" My boyfriend's patience was dead, and he raised his voice as well, saying: "Because we were told to wait there!" and pointed towards the beach. The old lady said: "You should have been here!" My boyfriend replied with: "Well, that's YOUR fault!" The old lady just shook her head and mumbling in Thai. She called the taxi driver, and after 5 minutes we got picked up. The next day we checked out. If you want good and top service, don't come to Tropicana. Of all the traveling I've done in Asia, this episode was the worst I've ever had. Great room, but lousy treatment. It was clear that the staff didn't communicate with each other, and it was clear that the young girl was acting like her age and not as a professional. There was absolute no professionalism among the staff at Tropicana resort. One exception was the receptionist who accepted us the first day and who arranged the snorkeling trip, but she weren't there when it exploded. What about the food at their restaurant? The Thai guys who served the food were cool and friendly. But, oh dear, I've tasted a lot better food. They served Western and Thai dishes. Their Pad Thai was good, the spring rolls were not good, and their pizza was not a pizza. It was a pile of cheese on top of flattened bread. I haven't stayed here, but before coming to Koh Tao it was recommended by some Swedish friends as budget accommodation on Baan Kao beach. If you're just looking for a place to sleep, then Taraporn is the right place for you. My girlfriend referred to Taraporn as "Idyllic, but rotten." Rotten in her vocabulary means basic. And the huts at Taraporn are plain wooden huts, nothing more and nothing less. After Tropicana, we tried to get a room at Mania guesthouse but it was full so we moved to Turtle guesthouse! This was a weird, but clean place. We paid 700 B for AC-room, but they said that the air-con would not work until midnight... Big mistake though, because this was in the beginning of May month and it was damn humid and hot. So the best part about Turtle guesthouse was its balcony. There's nothing better than a fresh breeze! We checked out of Turtle guesthouse the next morning, and left Koh Tao. The accommodations below are not tried and tested by the author. Baan Tai was one of the guesthouses I looked at when looking for budget accommodation in Mae Haad Bay. 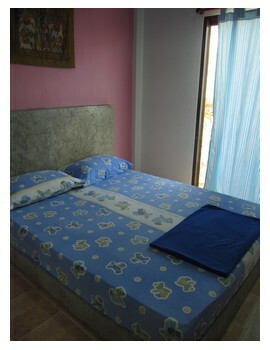 The price is alright for a basic double room with attached bathroom and fan, and it looked spotless. Students who are enrolled on a PADI 'diver level' get free accommodation (applies only to standard fan bungalows). I tried to explain that I didn't know that yet. They politely explained that they had to spare the rooms for potential student divers, especially before the Full Moon party. Crystal Dive seemed like a very popular, and therefore a busy place. Groups of divers were going in and out of the water, and the whole place had a laid-back atmosphere to it. "In Koh Tao the highlight was Big Blue Diving. They have great diving deals, great nightlife, good and cheap bungalows, good food and the diving was - amazing." Looking for bungalows and resorts in Koh Tao? How is the weather in Thailand? What are the tourist visa requirements for Thailand?